The photo below was probably taken in late 1923. This is the Solana Plaza looking eastward toward what is now Lomas Santa Fe Drive. 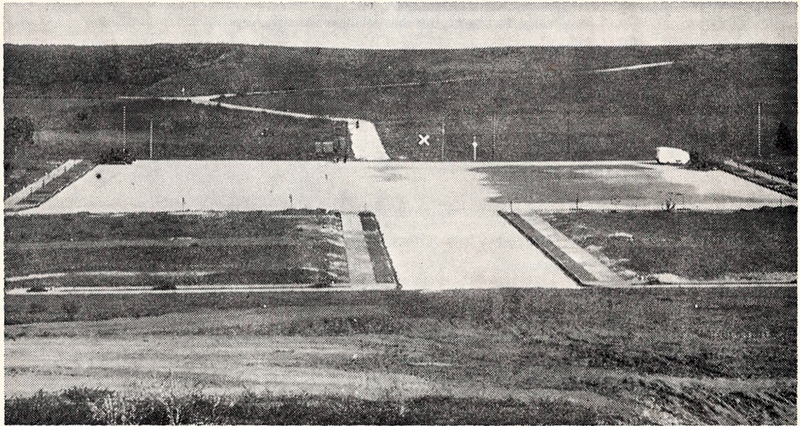 Sierra Avenue (in the foreground) is not yet paved. Just this side of the railroad tracks is Hwy 101, a paved, very narrow, two-lane road. At this time there were probably only four homes in Solana Beach. The Solana Hotel was constructed shortly after the Plaza was completed. The next photo below shows a view looking east from Sierra featuring the north side of Plaza. The west end of the Solana Beach Hotel is now under construction. The hut for selling lots on the east end of the hotel dates this photo to 1924. All the construction, plus the planting of the avocado groves to the east, occurred in a short period of time. The opening of the beach at Fletcher Cove, on July 4, 1924, helped spur Solana Beach investment and sales of lots for new homes. The Victorian building here at 117 W. Plaza will be built in the vacant lot west of the white building on the south side of Plaza (the Ford Garage). It originally had pool tables and, after prohibition was repealed in 1933, served beer and wine. Clarence Dowd ran it in the late 1930s. There were living quarters upstairs.